This page offers an alphabetical listing of Egyptian institutions initially created by Sarah Sterner, an International Studies major and Arabic minor at Miami University. Besides those mentioned in Connected in Cairo, the list includes those mentioned in this blog, and other key institutions that have been important in the Egyptian uprisings and other recent Egyptian history. Al-Ahram: Flagship state-run newspaper in Egypt with the highest circulation. Founded in 1875 in Alexandria; moved to Cairo in 1899. Did not report on the protests in Cairo initially, and blamed outside influences as the main cause for the riots, but eventually changed its stand on the uprising on February 7. Officially apologized to the Egyptian people on February 13 for its decades of political bias toward the Mubarak regime, and pledged to side with the people in the future. Al-Arabiya (“The Arabic One”): UAE Arabic TV news channel, located in Dubai. Started in 2003, it is now one of the top Arab news stations, available only by subscription. Mubarak used this channel to defend himself publically, rather than an Egyptian state-run media outlet. Al-Asala (Authenticity Party): Salafi party founded after the Egyptian uprising in August 2011 by Adel abd al-Maqsoud Afify. Supported by many Salafi preachers, including Sheikh Mohamed Hassan. Platform includes establishing an Islamic state, fighting corruption, ensuring justice and equality for all Egyptians, restoring Egypt’s leadership role in the world, and rejecting the Camp David Accords. Second Salafi party to gain official recognition, and part of the Democratic Alliance. Al-Azhar Founded in the 10th century, Gama’at Al-ʾAzhar ash-Sharīf is the largest institute of Islamic learning in the Sunni Muslim world. Its Islamic scholars issue fatwas on all manner of disputes over proper conduct for Muslim individuals and societies. 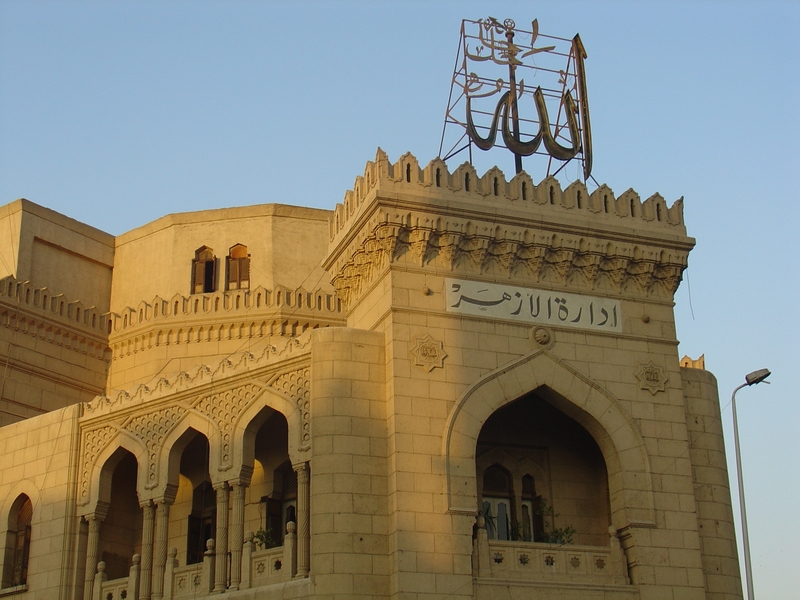 Al-Azhar also trains preachers and legal scholars from throughout the world. It does not only train in Islamic subjects; the university offers degrees in agriculture, engineering, pharmacy, and many other topics. Al-Azhar University is associated with the Al-Azhar mosque, and its library is one of the finest in the Middle East. Al-Banna’ wa al-Tanmiyya (Building and Development Party): Official party of the Gama’a al-Islamiyya, founded in June after the Egyptian uprising by Tareq al-Zumr and Safwat Abd al-Ghani. Platform includes the principles of justice, plurality, equality, the peaceful rotation of power, legal, political, and constitutional reform, and the modern application of Islamic law, including Islamic hudud. Formerly a member of the Democratic Alliance, but now part of the Islamist Alliance, after criticizing the Muslim Brotherhood for monopolizing the Democratic Alliance. Al Dustour: Independent Egyptian Newspaper. Founded in 1995 with Ibrahim Eissa as its editor-in-chief, Al-Dustour (“the Constitution”), it was originally run as a Cypriot newspaper to evade Egyptian restrictions. In 1998 it was closed down by the authorities. The paper was revived in 2005. It’s editor was sentenced to two months in prison on charges of insulting the President but pardoned by Mubarak. Al-Fadila Party: Salafi Islamist party, founded in October 2011. Aligned with Al-Nour Party, and part of the Islamist Alliance. Did not field any candidates in the parliamentary elections. Al-Faraeen: Independent TV channel owned by millionaire Tawfiq Okasha that focuses on controversial talk shows, current events and political news. In 2010 the Simon Weisenthal Center called for a boycott of the station’s European partners after Okasha defended programs questioning the Holocaust and reporting the Protocols of the Elders of Zion as factual documents. Al-Harakah al-Insaniyyah Li al-Islah wa al-Taghier (Human Movement for Reform and Change Party): A newly established political party by an al-Jama‘ah al-Islamiyyah offshoot group led by Ahmad Subh (president) and Ashraf Abd al-‘Al (vice president). Al-Hizb al-Arabi al-Democrati al-Nasseri (Arab Democratic Nasserist Party): Left-leaning secular party founded 19-4-1992. Successor to Nasser’s Arab Socialist Union party. Based on the ideologies of Arab nationalism and pan-Arabism. Its platform also includes renouncing violence and combating terrorism, protecting public freedoms, enhancing the public sector, and inter-Arab economic integration. Al-Arabi is the party’s official weekly newspaper. Al-Hizb al-Ishtiraki al-Misri (Socialist Party of Egypt): Left-leaning secular party founded in 2011 after the Egyptian uprising. Entered the Coalition of Socialist Forces with four other left-leaning Egyptian political groups in May 2011. Al-Hizb al-Misri al-Liberali (Liberal Egyptian Party): Formerly Mother Egypt Party (Hizb Masr el-Omm). Founded by Mahmoud Alphraouni, prior to the Egyptian uprising. A grassroots secular Egyptian nationalist party, based on the ideals of a secular and democratic government, as well as a capitalist economy. It also calls for stronger and more stable relations with Israel and the West. Al-Hizb al-Sheyoo’ey al-Misri (Egyptian Communist Party): Far-left secular party founded in 1975. Faced repression by the state and was banned from running in elections under the Mubarak regime. Joined the Coalition of Socialist Forces in May 2011 with four other leftist Egyptian political groups. Al-Ihyawat: Bedouin tribe in Egypt. Hosted a tribal conference in Ismailia to establish a new political party. Al- Jama’a al-Islamiya (The Islamic Group): Egyptian Islamist group, considered a terrorist organization by the United States, the European Union, and former Egyptian governments. Dedicated to the overthrow and replacement of the Egyptian government with an Islamic state. Following the Egyptian uprising in 2011, worked to establish the Building and Development Party. Stresses the importance of achieving national unity within Islam and guaranteeing the rights of religious minorities. Al-Jazeera: (Also JSC: Jazeera Satellite Channel) Founded in 1996 by the Emir of the state of Qatar, Sheikh Hamad bin Khalifa, after the BBC’s Arabic language television station discontinued its service. This independent Arab cable television network served as a model of fearless journalism in the face of censorship during the uprising. Threatened multiple times by the Egyptian police, with six people arrested and taken into custody. Converted to a 24-hour news organization during this time period of the uprising. Al-Quds al-Arabi: Palestinian-owned daily newspaper. Analyzed the change in Egyptian media as a result of the revolution, and criticized Mubarak as arrogant. As-Safha Ar-Rasmiyah Iltihad Shabab Maspero (Maspero Youth Union): An organization of young Coptic activists who acted as spokespeople and helped organize Coptic rallies in Cairo throughout the months of March-June, 2011. They protested sectarian violence and demanded government reforms to protect and ensure minority religious rights. They primarily protested outside the Maspero Building, which is home to the Egyptian state media. Although claiming to speak on behalf of Egyptian Copts, the group challenged the previous sole authority of the Coptic Church, which campaigned against Coptic participation in protests throughout the uprising. The members are participating as leaders in the discussion of the place of Christians in the new Egyptian government. Al-Sha’ab: Newspaper of the Labor Party. Often described as a “gadfly” newspaper, it’s been the source of many controversies, including a 1996 series of articles on a minister that led to fines (and threats of imprisonment) for the editor, and a 2000 book review that framed a modern Arabic classic as a filthy, blasphemous novel. Suspended in 2000 by the Egyptian committee for political parties’ affairs, the newspaper won seven court rulings insisting on its reinstatement, while the government delayed implementing them. Al-Shuruq: Independent daily newspaper in Egypt. Name means “Sunrise.” (Also sometimes written as Al-Shorouk, Al-Chourouk, or Shorouk News). Al-Tahaluf al-Dimuqrati (The Democratic Alliance): Nationalist and Islamist political alliance founded June 2011. Dominated by the Muslim Brotherhood’s Freedom and Justice Party, but contains many other parties, including Freedom Egypt Party, Al-Nour Party, Justice Party, New Wafd Party, Al-Ghad, Arab Democratic Nasserist Party, and the Dignity Party. United in their support of a more nationalistic, less pro-Western foreign policy. Al-Tayar al-Misri (Egyptian Current Party): Moderate Islamist party founded after the Egyptian uprising by youth of the Muslim Brotherhood who refused to join the Freedom and Justice Party, including Mohammed al-Kassas, Islam Lotfy, and Ahmed Abd al-Gawad. Platform includes the protection of civil liberties and social justice, Islamic values without Islamic law, democracy, political participation and equal opportunities for all Egyptian citizens, and ending military trials of civilians. Criticized the Muslim Brotherhood for archaic values. Member of the Revolution Continues Alliance. 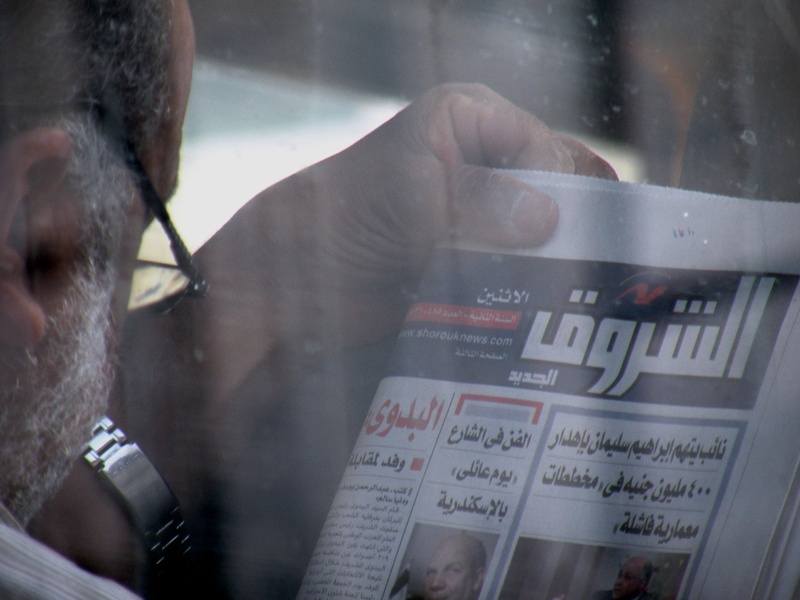 Al-Wafd: Founded in 1984, this is the official newspaper of the Wafd Party. Al-Wa’l (Awareness party): Centrist party lead by Shady Ghazali Harb. Fielded candidates in Cairo for the parliamentary elections. American University in Cairo (AUC): Founded in 1919, AUC is an elite private university in Egypt. It started as a Presbyterian mission school that focused on secondary education, and is now a secular liberal arts university characterized by cosmopolitanism and connections with multinational corporations. It used to be located in the heart of Cairo, but has since relocated to the outskirts of the city. AUC has frequently been a target of controversy, as well as the alma mater to several activist leaders. American University in Cairo Press. Leading English publisher of academic work in the Middle East. Established in 1960, it specializes in English translations of major Arabic authors, and Middle East editions of academic works on Egypt. Owns a large bookstore fronting Tahrir Square, from which snipers fired on protesters during the early days of the 25 Jan. protests. April 6 Youth Movement: Left-wing political movement founded as a Facebook group to in 2008 in order to support workers who were planning to strike on April 6. Played a vital role in the Egyptian uprising though Facebook and other social media. Concerns include free speech, nepotism in government, and Egypt’s stagnant economy. Supports democracy, social justice, free and fair elections, civil resistance, and secularism. Founders include Ahmed Maher, Asmaa Mahfouz, and Israa Abdel Fattah. Arab Equality and Justice Party: Right-leaning party created by former NDP members following the Egyptian uprising, in October 2011. Fielded candidates in Assiut for parliamentary elections. Arabic Network for Human Rights Information: Online repository of human rights information throughout the Middle East and North Africa. Collects publications and statements of various local, regional, and international human rights organizations and assembles them in a central website for an Arabic-speaking audience. Provides technological support and training to regional human rights organizations and seeks to expand freedom of opinion and expression on the internet in the Middle East. Arabic Party: New political party established by Bedouin tribes, although membership is not strictly based on tribal or Bedouin affiliations. Azaimiya Sufi order: Centuries-old spiritual Islamic group that seeks closeness with God through mystical rituals, and emphasizes inner purification. Believed Islamist groups following the Egyptian uprising could threaten their traditions, and many oppose the creation of an Islamist state. Weak internal political and organizational power, but many joined the al-Tahrir party after it pledged to defend Sufi interests. Bassem Youssef’s B+: A five-minute YouTube comedy show on the model of the US Daily Show featuring doctor turned comedian Bassem Youssef. The show was an unparalleled success, and soon moved to Egyptian network television ONTV, one of the two major independent networks (see El Bernameg). Center for Entrepreneurship (C4E): A platform created by the Nebny Foundation to start and grow new businesses in Egypt. Provides services to entrepreneurs such as market economic approaches and techniques. Center for Trade Unions and Workers Service: Group of labor activists working to form an independent trade union federation that represent the concerns of the workers. Filed a suit to dissolve the old Egyptian Trade Union Federation, which is controlled by officials associated with the Mubarak regime. Civilization Party: Centrist liberal party formed in July following the Egyptian uprising by Hatem ‘Azzam and Mohammed El Sawi. Part of the Democratic Alliance. Coalition of Socialist Forces (CSF): Far-left secular political alliance, founded 10-5-2011. Group of five socialist and left-leaning political parties, including the Egyptian Communist Party, Popular Democratic Alliance Party, Revolutionary Socialists, Socialist Party of Egypt, and the Workers Democratic Party, combining over 5,000 members. Joined together to create a more dominant leftist force in the Parliamentary elections, and promote national unity. Coalition of the Youth Revolution: Leftist alliance of organizations of young people involved with the Egyptian uprising. Includes the April 6 Youth Movement, a youth organization of the Muslim Brotherhood, and supporters of Muhammad ElBaradei. Met with the Supreme Council of the Armed Forces to negotiate the resignation of the Minister of Interior, the reinstitution of a fair minimum wage, and the end of Emergency Law. St. Mark’s Cathedral in Alexandria is the official seat of the Coptic church. Coptic Church: The Coptic Orthodox Church of Alexandria is the oldest and largest Christian denomination in the Middle East. Tradition claims the Church was founded by St. Mark in the first century AD. The church actively campaigned against Coptic participation in the Tahrir Square protests throughout the uprising, but was subsequently challenged by the Maspero Youth Union. 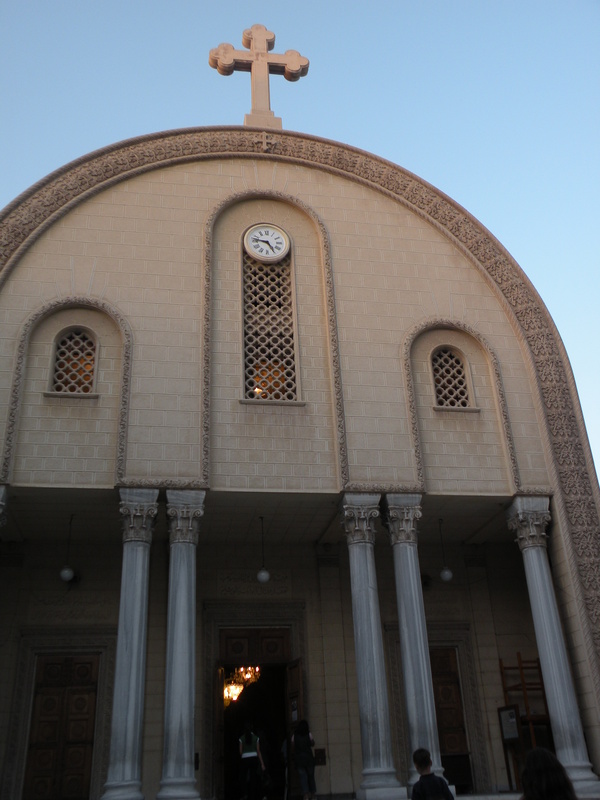 The Church ultimately claimed that it did not support the protesters out of fear for further marginalization of Egyptian Copts, although it does support the ideals of the revolution, such as the protection of civilian and minority rights. Economic Reform and Structural Adjustment Program (ERSAP): Agreements between Egypt and the World Bank and IMF concluded in 1991 during the Mubarak regime. The Egyptian government subsequently adopted neo-liberal economic policies and privatized 190 public-sector firms by 2002. Egypt Development Party: Political party founded by Yomna Al-Hamaki, a former NDP member. Egypt.Now Festival: Created by the Nebny Foundation to capture the essence of Egypt after the uprising, including the themes of youth, change, and freedom, and invite others to support Egypt. It occurred from July 1-18, 2011 in various venues and cities, including Alexandria and Cairo. Three main elements of the festival included film and music, a job fair, and a craft market. The goal of the Nebny Foundation is to make this an annual event. Egypt Remembers: A web site hosting photographs and brief biographies of many of those killed in Tahrir Square during the protests. Egypt Revolution Party: Islamist party founded after the Egyptian uprising by Ahmed al-Sokary. Fielded candidates in Cairo and Alexandria for the parliamentary elections. Egyptian Bloc: Liberal democratic and secular political alliance, founded 18 August 2011. The 15 groups are aligned primarily against the right-wing National Democratic Alliance for Egypt in the parliamentary elections. Includes the Free Egyptians Party, Freedom Egypt Party, Egyptian Social Democratic Party, Tagammu, Democratic Front Party, Popular Democratic Alliance Party, as well as the Sufi Liberation Party, and others. The ultimate goal is to establish Egypt as a modern civil democratic state, as well as promote equality and social justice. Egyptian Citizen Party: Leading party composed primarily of former NDP members, created after the Egyptian uprising. Headed by Salah Hassabullah and Mohammad Ragab, who was the Secretary-General of the NDP. The party claims about 6,000 members, throughout Cairo and Alexandria, and focuses on tribal and family ties. Fielded candidates for parliamentary elections in Cairo, Alexandria, Kafr ElSheikh, and the Red Sea. Egyptian Democratic Academy (EDA): NGO financed by the German Friedrich Nauman Foundation for Freedom, and trains young people in media production (radio, video and blogs), and in basic organization administration, legal procedures and election monitoring. Egyptian Democratic Party: Political party controlled by officials associated with the Mubarak regime. Egyptian Federation of Independent Trade Unions (EFITU): Created by other independent unions during the Egyptian uprising in opposition to the Egyptian Trade Union Federation, a Mubarak-era institution. Existence announced in Tahrir Square on January 30, 2011. Nominated Ahmad Hasan al-Burai as Minister of Manpower and Migration to the transitional government. Egyptian Independent: An English weekly newspaper published by the Al-Masry al-Youm newspaper syndicate. Its first issue appeared on Nov. 24th. The second issue was censored by the editor of its Arabic sister paper because of a controversial op-ed piece about Field Marshall Tantawi by U.S. scholar Robert Springborg. The newspaper’s editors suspended publication until an agreement giving them editorial independence could be reached. Egyptian Movement for Change: Left-wing political grassroots coalition founded in 2004. Served as a platform for solidarity and protest against the Mubarak regime prior to 2011. Egyptian Organization for Human Rights (EOHR). The Egyptian Organization for Human Rights is a non-governmental organization founded in 1985 to push for implementation of the principles established in the Universal Declaration of Human Rights in Egyptian society. It is currently directed by Hafez abu Sei’da. Documented 567 suspected cases of torture in Egyptian police stations between 1993 and 2007, including 167 deaths. The Egyptian Radio and Television Union: See ERTU. Egyptian Revolution Party: New Islamist party founded after the Egyptian uprising. Fielded candidates for parliamentary elections in Cairo and Alexandria. Egyptian Trade Union Federation (ETUF): Established in 1957, the Egyptian Trade Union Federation (ETUF) is a state-controlled organization representing Egypt’s unionized workers. The only officially recognized body to speak to the government on behalf of workers, it was widely understood to have been designed to control rather than represent Egypt’s 2.5 million workers in 23 unions. On 30 January 2011, a meeting convened in Tahrir Square led to the formation of an alternative organization, the Federation of Independent Egyptian Trade Unions, in hopes of breaking state control of the unions. Eid al-Fitr (“Festival of the Breaking of the Fast”). A Muslim holiday celebrated for 1-3 days beginning on the first of Shawwal. The Eid marks the end of the month of Ramadan, celebrating the conclusion of 29 or 30 days of dawn-to-sunset fasting. The Eid holiday is a typical time in Egypt for media to launch new television series or to release new movies. Elaph: Saudi-owned news website. Reported on the changing tone of Egyptian media post-Mubarak as an unprecedented historical occurrence of real transparency. El Bernameg: El Bernameg (“The Show”) is the public affairs comedy show by Bassem Youssef on ONTV. It began airing the first day of Ramadan 2011. It is a half-hour show in the tradition of the US’s The Daily Show or The Colbert Report. Emergency Law: Set of laws that go into effect when the president declares a “state of emergency,” in which constitutional rights are taken away from citizens and extra powers are given to police to arrest, detain, and interrogate. First imposed during the 1967 Arab-Israeli war, it effectively banned most political activity by opposition parties and allowed the Mubarak regime to suppress all dissent. One of the key demands of the uprising was to have the Law abolished, however the Supreme Council has stated that it will continue to implement the Law until the current civil disorder is ended. Equality and Development Party: Center-left partycreated after the Egyptian uprising. Platform based on social welfare and equality. Close to the youth of the revolution, and part of the Completing Revolution alliance. Headed by Taisser Fahmi, a Coptic actress. 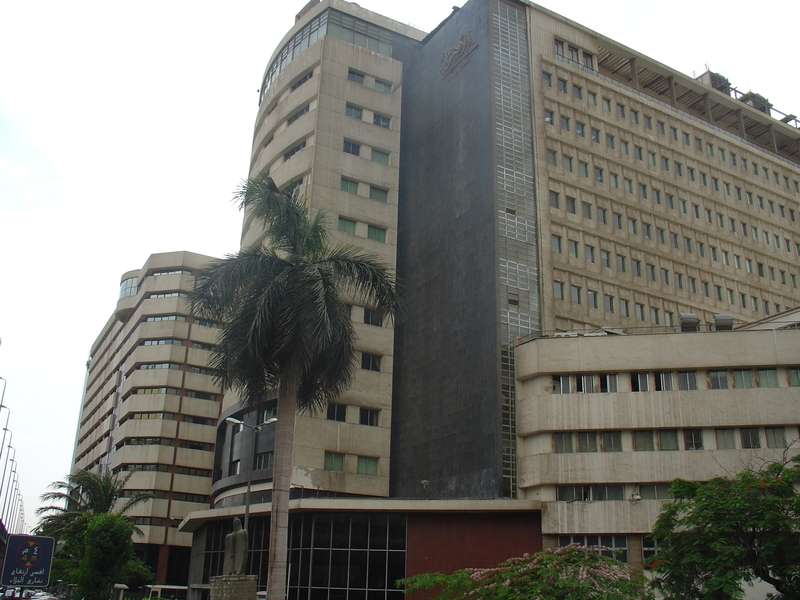 The Maspero Building has been the site of ERTU since its founding in 1960. ERTU: The Egyptian Radio and Television Union (Ittihad al-Idha‘ah wat-Tilifizyun al-Miṣri–always abbreviated ERTU irregardless of language) is the state agency that operates all broadcast television in Egypt. Its role as a voice of the state was sorely tried during the uprising, when it famously showed images of quiet streets even as protests of thousands of people were raging nearby. ETUF: See Egyptian trade Union Federation. Ezba (Al-izbah in Modern Standard Arabic). An ezba is a farming village consisting of the villa of the owner of most of the land, with a large private garden, surrounded by the agriculture workers’ houses. These types of villages emerged in the 19th century concurrent with the development of a new irrigation system comprised of water canals and trenches; the ezba was usually settled alongside these canals. A typical ezba consists of 20 to 30 families, 150 to 300 persons. Ezba Abu Gamal (The Village of Gamal’s Father). A blog that ran from 2006 to 2009 featuring funny stories about a fictional rural village run by Hag Mohammed Hosni Abu Gamal. The stories were a satire on the regime: the Ezba was Egypt, the Hag was Mubarak, and dozens of other well-known figures found their way into the cast. Stories about the village often paralleled events in Egypt. Ezbet Al-Haggana. With an estimated 500,000 people crowded into about 750 acres of land, Ezbet Al-Haggana is usually identified as the third largest informal settlement in Egypt. Lying about 4.5 kms outside of Cairo, this area was originally a military settlement in which soldiers from upper Egypt and the Sudan were allowed to buy land for extremely low prices. These families built houses, then sold the remaining land at market rates to others. This original area enjoys basic services like water, sewage, electricity, and transportation. However, three areas of shantytowns have grown up around the original area, and these receive no public services. Ezbet Khairallah. Covering an area of about 12 square km on a rocky plateau in the southern part of Cairo, Ezbet Khairallah is the second- largest unplanned community in Egypt, with a population close to 650,000. The population consists mostly of laborers and low-level craftsmen– ironmongers, carpenters, metal workers, upholsterers, glass-blowers, etc.—most of whom are underemployed. Although Ezbet Khairallah is located within the boundaries of Cairo, most basic services are missing, including water, sewage and electricity. Federation of Independent Egyptian Trade Unions. On 30 January 2011, a meeting convened in Tahrir Square led to the formation of the independent Federation of Independent Egyptian Trade Unions, in hopes of breaking state control of the unions. Signing the declaration were representatives of RETA,Retired Workers’ Union,Health Professionals Union and the Teachers’ Independent Union. The organization has been recognized by the International Trade Union Confederation, the world’s largest organization of labor unions. “The Village of Gamal’s Father” a roman-a-clef mocking the Mubarak regime, ran on-line from 2006-2009. Federation Party: New party comprised mostly of former NDP members, created after the Egyptian uprising. Lead by Hossam Badrawy, a former NDP Secretary-General. Fielded candidates for parliamentary elections in Alexandria, Assuit, Fayoum, Port Said, and Kafr ElSheikh. Group of 17: Internal faction of the Free Egyptians Party. Accused the leadership of undemocratic methods in choosing local leaders, as well as allowing former members of the NDP to join the party. Five of its members were labeled as troublemakers and officially banned from the Free Egyptians Party. High Election Judicial Commission: Established a website to facilitate voter registration for the Parliamentary elections in November, but is only accessible abroad. Higher Journalism Council: Appoints chief editors of national newspapers in Egypt. Headed by the Minister of Information. Hizb al-Adala al-Igtemaa’yia (Social Justice Party): Left-leaning non-secular democratic and progressive party founded 6-6-1993. Calls for equal rights and justice for all citizens, as well as national loyalty. Platform is also based on Islamic shari’a as the main source of legislation. Hizb al-Adl (Justice Party): Centrist secular party founded in 2011. Platform of justice, security, a parliament that is authorized to monitor the executive branch and hold the leaders accountable, reforming education, the security apparatus, and monopolies. Hizb al-Ahrar (Liberal Party): Liberal democratic party founded in 1976. Platform based on free speech and press, free elections, enhancing the private sector, independence of the judiciary, and educational development. It also proposes Islamic shari’a as the main source of legislation. Currently chaired by Helmy Ahmed Salim. Hizb al-‘Amal al-Ishtraki (Socialist Labour Party): Left-leaning non-secular Islamist party founded in 1978 by Ibrahim Shoukry. Although it began as a socialist party, it underwent an ideological change in 1986 to an Islamist party, and was renamed the Islamic Labour Party. Its platform calls for an economic system based on Islamic Shari’a, unity between Egypt, Sudan and Libya, liberating the occupied Palestinian lands, and promoting ties with developing countries. Currently suspended. Hizb al-Bidaya (The Beginning Party): Newly formed party, consisting mostly of former NDP members. Founded by businessman and former police officer Mahmoud Hossam Eddin Galal. Hizb al-Distouri (Constitutional Party): Liberal democratic and socialist party founded in 2004. Its platform is based on drafting a new Constitution, education, health, judicial, economic, and bureaucratic reform, such as creating a more favorable investment atmosphere and providing high-quality social services. Currently chaired by Mamdouh Qenawi. Hizb al-Geel al-Democrati (Democratic Generation Party): Liberal democratic party founded in 2002. Its platform includes national unity and integration, educational reform, and an agriculture oriented technology infrastructure. Its current chairperson is Nagy Abdel-Fattah Al-Shehabi. Hizb al-Ghad (Tomorrow Party): Centrist liberal secular party, and the first opposition party to Mubarak’s regime, founded in 2004. Platform of widening scope of political participation and peaceful transfers of power, as well as political and economic reforms, combating drug addiction and solving the water crisis. Hizb al-Gomhory al-Ahrar (Free Republican Party): Liberal democratic non-secular party founded in 2006. Platform includes upholding Islamic shari’a as the main source of legislation, supporting political and social freedoms and human rights, a constitutional rule of law, separation of powers, multi-partisanship, social justice, and the revival of Arab nationalism. Hizb al-Horriya (Freedom Party): Composed of around 8,000 members, most of whom are former-NDP. Mamdouh Ali Hassan, former NDP parliamentary spokesman, heads it. Prepared to support 106 candidates in the parliamentary elections so far, with a hope of contributing over 500. Claims to be a liberal party that supports the democratic ideals of the uprising. Opposed to a religious state that is dominated by Islamists. Hizb al-Horriya wa Alaadala (Freedom and Justice Party): The official Muslim brotherhood party; right-leaning, Sunni Islamic party, founded in 2011 after the Egyptian uprising. Advocates for an Islamic democracy, with Islamic shari’a as the primary source of law. Plans to run a candidate in up to half the seats in the parliamentary elections, and is expected to win a majority of the seats it contests. Currently led by president Mohamed Morsy, vice president Essam al-Erian, and secretary general Saad al-Katatny. Hizb al-Ishtarakiya al-Souriya (Revolutionary Socialist Party): Far-left secular political group founded in 1995. A Trotskyist organization aligned with the International Socialist Tendency, as well as the Workers Democratic Party and the Coalition of Socialist Forces within Egypt. Involved in the workers movement and played a role in mobilizing for the Egyptian Uprising. Called for a permanent workers’ revolution against the capitalist government, as well as dismantling the Military Council, the army and police force. Lead by Kamal Khalil and Sameh Naguib. Hizb al-Islah wa al-Tanmiyya (Reform and Development Party): Secular liberal party that began as a splinter group from the Democratic Front in 2009. Was unable to register as an official party until May 2011 after the Egyptian uprising. Merged with Our Egypt party in June 2011. Headed by Ramy Lakkah and Anwar Tal’at Esma’t Sadat. Platform includes creating an independent committee to ensure free and fair elections, monitoring corruption, promoting free market policies, establishing a separation between religion and politics, and opposing the normalization of relations with Israel. Hizb al-Itahadi al-Democrati (The Democratic Unionist Party): Liberal secular party founded on 14-4-1990 and currently chaired by Mr. Ibrahim Mohamed Tork, whom the party nominated to fun in Egypt’s first contested presidential elections. The party’s platform is based on achieving unity between Egypt and Sudan, the separation of politics and religion, the promotion of freedom and political rights, and comprehensive economic development. Hizb al-Karama (Dignity Party): A left-wing Nasserist offshoot led by journalist and MP Hamdin Sabbahy and Amin Iskandr. Founded in 1996. Platform based on Arab unity, an end to the emergency law, presidential term limits, gender equality, the separation of powers, a centrally planned economy, independence from Western institutions, the liberation of the Palestinian nation and the rejection of previous agreements with Israel. A member of the Democratic Alliance. Hizb al-Khodr (Green Party of Egypt): Liberal democratic and eco-socialist party founded in 1990 by Hassan Ragab. Advocates ecological protection, optimal resource use, sustainable development, and nuclear non-proliferation. It also addresses issues of social justice and human rights, and calls attention to the problems of globalism and capitalism, although it still upholds free market principles. Currently chaired by Dr. Abdul Moneim Al-A’sar. Hizb al-Misreen al-Ahrar (Egyptian Liberal Party): A nationalist secular liberal party, founded in 2011. Established by Egyptian billionaire Naguib Sawiris. Maintains the slogan, “We build the future together so Egypt restores its glories.” Espouses goals of social and economic reform, judiciary independence, separation of powers, and citizen rights. As a member of the Egyptian Bloc, it opposes the Muslim Brotherhood and promotes secular and civil society. Lead by Ahmed Hassan Said, Hani Sarie-Eldin and Basel Adel. Hizb al-Misri al-Democrati al-Ektemaii (Egyptian Social Democratic Party): Secular leftist liberal party founded in 2011 after the Egyptian uprising. Created from the merger of two smaller liberal parties, the Egyptian Democratic Party and the Liberal Egyptian Party. Founding members include Mohamed Abou Al-Ghar, Daoud Abdel Sayed, Amr Hamzawy, and Mervat Tallawy. Hizb al-Mohafiz (Conservative Party): Right-leaning, non-secular party founded by businessman Akmal Qortam in 2006. Platform includes universalizing the concepts of citizenship, protecting Egyptian industries, achieving greater productivity, as well as political, economic, educational, and social reforms. Consists of former NDP members. Hizb al-Nour (Party of Light): A right-leaning conservative Salafi party, founded in 2011 after the Egyptian uprising. Aims to eliminate economic and political corruption, as well as respect for the rights of all Egyptians. Lead by president Emad Eddine Abdel-Ghaffour. Hizb al-‘Omal al-Democrati (Workers Democratic Party): Left-leaning secular socialist labour party founded in 2011 after the Egyptian uprising. Opposed to the Free Egyptians Party, it is a member of the Coalition of Socialist Forces, and affiliated with the Federation of Egyptian Trade Unions. Advocates for a civil egalitarian system with a state-regulated economy. Other ideological demands include improved working conditions and the abolition of the peace treaty with Israel. Slogan is “the workers must be united.” Lacks official recognition under the Political Parties Law because it is a class-based party. Hizb al-Salam al-Democrati (Democratic Peace Party): Liberal secular party founded in 2005. Party platform calls for establishing democracy and peace in the region, boosting Egypt’s status at the regional and international levels, and ensuring women and citizen rights. Chaired by Ahmed Mohamed Bayoumi Al-Fadali. The party ran Hossam Khairallah as presidential candidate in the 2012 elections. Hizb al-Shaab al-Democrati (People’s Democratic Party): Liberal secular party founded in 1990. Headed by Ahmed Abdel Azem Kamel, and consists of about 275 members. Fielded one candidate for the 2000 parliamentary elections. Currently frozen. Hizb al-Tagammu al-Watuni al-Taqadomi al-Wahedwi (Progressive National Unionist Party): Leftist secular party founded in 1977. Only formal leftist party during Mubarak’s reign. Its aims include preserving worker and civil rights, Arab unity, freedom of the press, and an independent judiciary. Initially allied with the Democratic Alliance, it has since joined the Egyptian Bloc. Hizb al-Tahaluf al-Sha’bi al-Ishtiraki (Popular Socialist Alliance Party): Left-wing secular socialist party founded in 2011 after the Egyptian uprising. Consists of members from many leftist organizations, including former members of the Tagammu Party. Affiliated with the Coalition of Socialist Forces and The Revolution Continues Alliance. Officially recognized as a political party in September 2011. Hizb al-Tahrir (Party of Liberation): Right-leaning non-secular party founded in 1953, and banned in 1974. Hizb al-Takaful (Solidarity Party): Right-leaning non-secular Islamist party founded in 1995. The current chairman is Dr.Osama Mohamed Shaltout, and it consists of about 970 members. Hizb al-Umma (The Nation’s Party): Islamic social-democratic party founded in 1983. Platform includes socialist democracy, Islamic shari’a as the basis of legislation, and support for a peace with Israel. Chaired by Ahmed Al-Sabahi Khalil with a total membership of around 185 members. Hizb al-Wafd-al-Gadid (New Wafd Party): Centre-right liberal secular nationalist party established in 1983 as an extension of the Wafd Party, which was dismantled after the 1952 Revolution. Joined the National Democratic Alliance for Egypt electoral bloc after the Egyptian uprising. Platform includes political, economic, and social reforms, multi-party democracy, national unity, human rights, the abolishment of the emergency law, and a more balanced approach between the public and private sectors of the economy. Chaired by El-Sayyid el-Badawi. Hizb al-Wasat (Center Party): A Muslim Brotherhood offshoot with moderate centrist tendencies, led by Abul-Ela Madi. Founded in 1996 and officially recognized in 2011, it was the first official party to gain recognition after the resignation of Mubarak, as well as the first legal political party in Egypt with an Islamic background. Hizb al-Watani al-Democrati (National Democratic Party): Founded in 1978. Essentially the only political party during Mubarak’s regime, winning nearly all the parliamentary seats. Composed of mostly powerful, corrupt businessmen. While in office, many politicians took advantage of their positions to build vast financial empires. Now essentially obsolete post-Mubarak, although many of its former members have joined various new political parties that seek to form alliances against Islamists in parliamentary elections. Tried to clear itself of the corrupt images associated with the Mubarak regime. Hizb al-Wifak (National Conciliation Party): Left-leaning secular nationalist party founded in 2000. Platform includes a resolution to the Palestinian issue, Arab economic integration and self-sufficiency, and solving issues related to education, unemployment, and the youth. Chaired by Refaat Al-Agroudy and consists of 185 members. Hizb Misr al-Arabi al-Ishtaraki (Egyptian Arab Socialist Party): A left-leaning, Arab-nationalist and Islamic socialist party, founded in 1977. Party platform includes adopting Islamic shari’a as the main source of law, freedom of expression and religious affiliation, pluralist democracy, liberating the occupied Palestinian lands, and achieving unity with developing countries. Headed by Wahid Al-Uksory, it consists of 750 members. Hizb Misr al-Fatah (Young Egypt Party): Left-leaning Islamic socialist party founded in 1990. Party platform calls for enhancing Egyptian-Arab ties, achieving integration with African countries, and establishing a socialist Islamic economic system. Headed by Abdallah Rushdi, it consists of 225 members. Hizb Misr al-Haditha (Modern Egypt Party): Founded by businessman Nabil Deibis. Consists of mostly former NDP businessmen. Espouses market-economy and liberal democratic ideals. Hizb Misr al-Hureyya (Freedom Egypt Party): Centre-left secular liberal democratic party founded in 2011. Formed by activist Amr Hamzawy after he resigned from the Egyptian Social Democratic Party. Consists of mostly Egyptian youth. Hizb Misr al-Nahda (Renaissance Egypt): Newly formed political party composed primarily of former members of the NDP. Hossam Badrawi, a former NDP secretary-general, created it. Claims to be a platform for liberal and modern ideals, as characterized by its younger members. Hizb Misr al-Qawmi (Nationalist Egypt Party): Newly formed political party which consists of many former NDP members, including members of the family of the former president Anwar El-Sadat. Sadat’s nephew Talaat Sadat, who was the former chairman of the NDP, founded the new party after the NDP disbanded. Hizb Misr 2000 (Egypt 2000 Party): Left-leaning secular party founded in 2001. Its platform includes a rejection of Western values of globalization, national and social unity, and political pluralism. Nominated Dr. Fawzy Khalil Ghazal to run in the presidential elections. Human Rights and Citizenship Party: Centrist party founded after the Egyptian uprising by Gamal Al-Tohami. Fielded candidates for parliamentary elections in Alexandria and Assiut. I Am #Jan 25: A web site hosting an on-line archive of videos and photographs. Within a month of Mubarak’s resignation there were already nearly 3,000 videos archived across 85 pages, and over 4,000 photographs across 130 pages. Each photo and video lists the url from which it came. Ittihad al-Idha‘ah wat-Tilifizyun al-Miṣri: See ERTU. Information Technology Industry Development Agency (ITIDA). Created in 2007, this agency’s job is to build the capacities of local IT companies and grow a qualified, sustainable and deployable IT talent pool. Kulana Khaled Said (“We are all Khaled Said”): A Facebook page created by an anonymous administrator (later revealed to be Google manager Wael Ghoneim) that posted photos and news about Khaled Said’s case, then gradually grew into a clearinghouse of information about police brutality and rights abuses in Egypt, posting graphic photo and video, and publishing the names of allegedly abusive cops. By the time of the Jan 25 protests–of which it was one of the advocates, its membership was more than 375,000. Mansheyet Nasser. Commonly known as Mogattam (after the plateau on which it is located) or “Garbage City” (because it is the traditional home of the informal rubbish collection industry), this squatter settlement of more than 800,000 has the most extreme concentration of poverty of any urban area in Egypt. The area began to be settled in the late 1950s and early 1960s by rural migrants from Upper Egypt. Its population swelled as urbanization projects pushed tens of thousands of people out of Cairo. As a squatter community, most parts of Manshayet Nasser lack water, sewage and electricity. Maspero Building: Named for the French archaeologist who helped uncover the Sphinx, this huge building on the bank of the Nile river in Cairo is the headquarters of the Egyptian Radio and Television Union, which operates the state-run television and radio channels, and facilitates private channel uplinks to Egyptian television satellites. The building was authorized by President Nasser and completed in 1960. 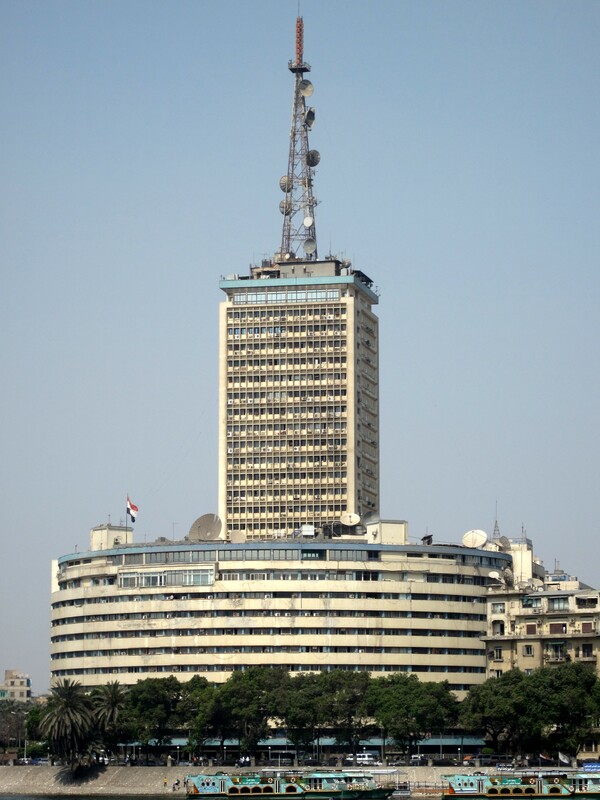 The first Egyptian television broadcast was transmitted from the building a few weeks later on July 21, 1960. Ministry of Information: Managed the production of news at the cabinet level during the Mubarak regime. Muslim Brotherhood: One of the most experienced and organized political groups in Egypt, founded in 1928. Islamic organization that supports an extensive range of charitable activities as well as political efforts. Outspoken critic of the Mubarak regime, the Brotherhood was banned for decades until the resignation of Hosni Mubarak.Its anticipated leadership role in a democratic Egypt is feared by many outsiders. National Archives. The National Archives of Egypt is a government agencies that collects, preserves, catalogs and archives documents of Egyptian history dating as far back as the 12th Century AD (6th century AH). In February 2011 it began a project to collect and archive documents relating to the 2011 Egyptian uprisings. National Association for Change (NAC): One of the most visible political opposition groups that challenged the Mubarak regime. Platform includes pro-democracy constitutional reform, free and fair elections, social justice, ending the state of emergency, and ending military trials of civilians. Formed by Mohamed ElBaradei in 2010. Nebny Foundation: Non-governmental organization created by Jawad Nabolsi after the Egyptian uprising. Comprised mostly of young activists, volunteers, and revolutionaries who strive to help craftsmen who are economically disadvantaged by providing business start-ups and helping them sell and market their services in the current Egyptian economic environment. The foundation strives to create more than 30,000 employment opportunities for the young, including construction, renovation and neighborhood remodeling jobs in Cairo. New Independent Party: New party composed of former NDP members, formed after the Egyptian uprising. Fielded candidates for parliamentary elections in Cairo. No To Military Trials for Civilians: Campaign composed of members of the ongoing Egyptian Revolution. Holds the belief that the end of military trials and a return to a civilian judiciary is a key requirement for freedom and democracy. Maintains an active online list of current civilian detainees, since the Egyptian uprising. Promoted the International Day of Solidarity on November 12, 2011. Branch offices located in Cairo and Alexandria. People’s Assembly: Legislative body comprised of 454 members, 444 of whom are elected for a five-year term and 10 of whom are appointed by the president. During the Mubarak regime, it was composed of politicians who, in many cases, bought their rights to run for elections. Original body that nominated the President. Police Day: January 25, a national holiday that commemorates the martyrdom of Egyptian police officers at the hand of British troops. Coincides with the start of the Egyptian uprisings. Popular Front for Justice and Freedom: Political party established by bedouin sheikh Hussein Nour Hussein Salem, who rejected any relation with another Bedouin party, the Arabic Party. Reform and Renaissance Party: Islamic party founded after the Egyptian uprising. Associated with the Freedom and Justice Party and linked to a Muslim Brotherhood dissident group, as well as a member of the Democratic Alliance. Headed by Hesham Mostafa Abdel Aziz. Renaissance Egypt Party See Misr An-Nahda. The Revolution Continues Alliance (RCA): Left-leaning coalition consisting of the Popular Socialist Alliance Party, the Egyptian Current Party, the Revolution Youth Coalition, the Egyptian Socialist Party, the Egyptian Alliance Party, and the Equality and Development Party. Platform based on fighting for the ideals of the revolution and freedom of expression for youth, women, and Copts. Its slogans are Security, Freedom and Justice. Launched its parliamentary election campaign in early November 2011, which includes running 268 candidates. 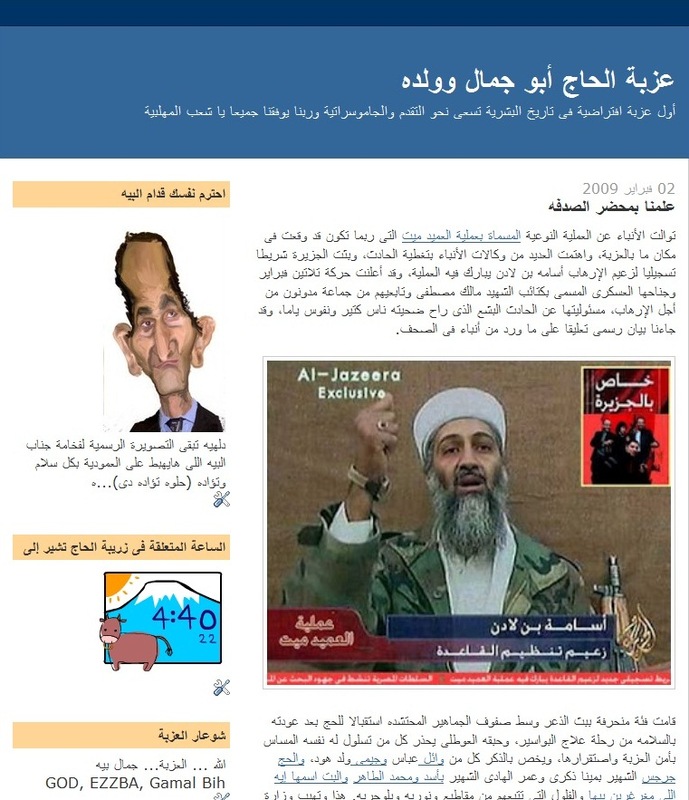 Sawat Ghadib: “An Angry Voice;” Arabic-language blog created by a high school dropout turned political blogger. Critical of President Mubarak, and a strong advocate for the people of Gaza, author Diaa Eddin Gad was taken into custody in 2009 and as yet to be released. Shabab-al Facebook: Term used to describe the technologically sophisticated youth movement within the urban centers that began to strike and protest in solidarity in the uprising. Shura Council: Upper House of the Egyptian Parliament. The Socialist: Newspaper produced by the Revolutionary Socialist political party. Supreme Council of the Armed Forces (SCAF): The supreme military authority in Egypt, this council was headed by Hosni Mubarak before his resignation. After his resignation, this council, now headed by Mohamed Tantawy, became the rulers of Egypt. Transparency International (TI): Non-governmental organization that monitors and publicizes corporate and political corruption in international development. Publishes the annual Corruption Perceptions Index, which assessed Egypt in 2010 at a score of 3.1 on a scale of 0-10 (with 10 being completely clean and 0 being totally corrupt). Ultras: Ultras are sports fans renowned for their fanatical support of Egyptian sports clubs–especially Zamalek and ‘Ahly–and their elaborate displays intended to create an atmosphere that encourages their own team and intimidates opposing players and supporters. Ultra activity can lead to violence, and Ultra-police clashes have long been common (a common Ultra slogan is ACAB, meaning “All Cops Are Bastards”). Since the revolution, Ultras have involved themselves in fights between anti-military protesters and government security forces in Egypt. We Are All Khaled Said. English version of the Facebook site Kulana Khaled Said run by an anonymous administrator.